This sleek office chair's contemporary design matches the Futura table and organizer. 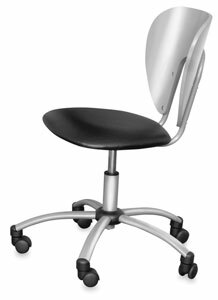 It features pneumatic height adjustment that raises the seat from 17" to 22" (43 cm to 56 cm) high and a five-star metal base with casters, for stability and mobility. The overall dimensions are 22¾"D × 32"H (58 cm × 81 cm). The Futura Chair includes a 10-year manufacturer's warranty. Footring Adapter Kit — Convert your Futura Chair with this easy-to-assemble kit. It includes everything needed to raise the height of the chair seat from 28–33" (71–84 cm) high. Durable, heavy-gauge steel construction assures long life, and the chrome footrest resists scratches. No tools are required for assembly.